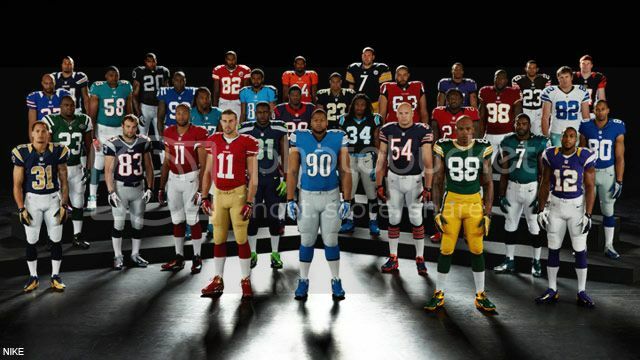 The NFL and Nike today rolled out new uniforms for all 32 teams as part of the new apparel sponsorship starting this week. Nike took the official supplier role from Reebok, which had previously maintained a 10-year, $250 million deal with the league. Nike is said to be paying what Bloomberg Business Week estimates could be $35 million per year for the new five year deal. Not coincidentally, Nike sued Reebok earlier this week over sales of Tebow-related apparel. But enough of all that. Here's a first look at Nike's new uniforms, dubbed the Elite 51, for a body-contoured fit resulting in zero distractions and amplified speed. For each team's uniform follow Darren Rovell on Twitter who happens to be live tweeting the unveiling for each team.